Not surprisingly, public support for the increased use of nuclear power has declined amid the ongoing nuclear emergency in Japan. Currently, 39% say they favor promoting the increased use of nuclear power while 52% are opposed. 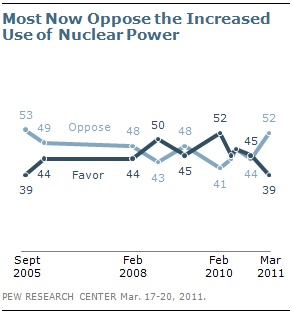 Last October, 47% favored promoting the increased use of nuclear power and the same percentage (47%) was opposed. Opinion about expanding the use of nuclear power has fluctuated in recent years. However, the current measure matches a previous low in support for increased nuclear power recorded in September 2005 (39% favor, 53% oppose). The latest national survey by the Pew Research Center for the People & the Press, conducted March 17-20 among 1,004 adults, finds little recent change in opinions about other energy policies — with one notable exception. With the recent surge in gas prices, support for increased offshore oil and gas drilling continues to rebound. Currently, 57% say they favor allowing more offshore oil and gas drilling in U.S. waters while 37% are opposed. Last June amid the massive oil spill in the Gulf of Mexico, there was more opposition (52%) than support (44%) for allowing more offshore drilling. Support for increased offshore energy drilling is approaching its pre-Gulf spill level; in February 2010, the public backed increased offshore drilling by about two-to-one (63% to 31%). The survey shows that substantial majorities continue to support increased federal funding for research on wind, solar and hydrogen technology (74%), spending more on subway, rail and bus systems (61%), and providing tax incentives for the purchase of hybrid vehicles (58%). These measures are virtually unchanged from last October, though there is less support for alternative energy research and spending on mass transit than from 2005 to 2009. There has long been a wide gender gap in views of increased use of nuclear power and these differences persist amid the crisis in Japan. By greater than two-to-one (63% to 26%), women oppose promoting the increased use of nuclear power. 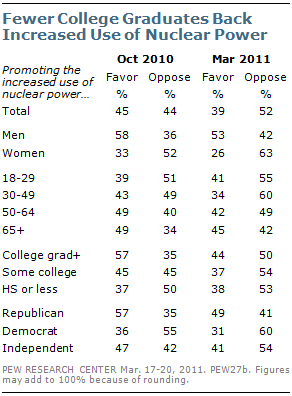 A narrow majority of men (53%) favor the increased use of nuclear power, while 42% are opposed. The proportion of college graduates that supports the expanded use of nuclear power has fallen by 13 points since October (from 57% to 44%). College graduates remain slightly more likely than those with less education to support more use of nuclear power, but the gap has narrowed. About half of Republicans (49%) favor the expanded use of nuclear power compared with 41% of independents and 31% of Democrats. There were comparable partisan differences in these views last October. Are U.S. Nuclear Plants Safer? Overall, about a quarter of Americans (24%) think that nuclear power plants in the United States are designed to be safer than those in Japan. A 53% majority says nuclear plants in this country are designed to be about as safe as nuclear facilities in Japan while 10% say plants in the United States are less safe. At the time of the Chernobyl nuclear accident in 1986, the public generally viewed U.S. nuclear plants as safer than those in the Soviet Union. In a May 1986 Washington Post/ABC News poll, 55% said that U.S. plants were safer (the question asked about overall safety, not the design of the plants). Public views of allowing increased offshore oil and gas drilling shifted noticeably last year in response to the Gulf oil leak. Since last summer, they have shifted again. Currently, 57% favor allowing more oil and gas drilling in U.S. waters, up 13 points since last June (44%). 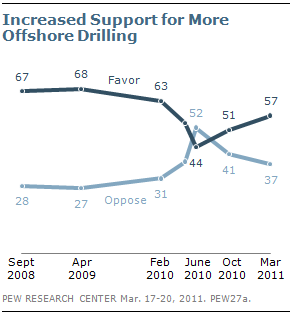 Nonetheless, support for expanded offshore drilling remains lower than in February 2010 (63%). Since last June, support for expanded offshore oil and gas drilling has increased across most demographic and political groups. Still, while support has jumped by nearly 20 points since then among both Republicans and Democrats, there continues to be a sizable partisan divide in these opinions: 81% of Republicans favor allowing more offshore oil and gas drilling in U.S. waters, compared with 54% of independents and 46% of Democrats. Opinions about other energy policies have changed little since last fall. These views also continue to be deeply divided along partisan lines. While 81% of Democrats and 79% of independents favor increased federal funding for research on wind, solar and hydrogen technology, far fewer Republicans agree (59%). Read the full report and see the topline questionnaire and survey methodology at people-press.org.